The ARRL Amateur Radio Service to Scouting Award was officially recognized by the Boy Scouts of America in 2014. The award recognizes actively involved Scouting leaders who make a significant contribution to providing Scouts with a memorable and valuable Amateur Radio experience. The BSA allows Scouting leaders to wear the Community Organization Award square knot on their uniform, in recognition of their service within their community organization. This award was officially established through a resolution adopted by the ARRL Board at its 2013 Annual Meeting. It builds on the long relationship between the BSA and ARRL that began with the development of the Wireless Merit Badge in 1918 — now the Radio Merit Badge. This relationship was formally recognized through a 2011 Memorandum of Understanding. 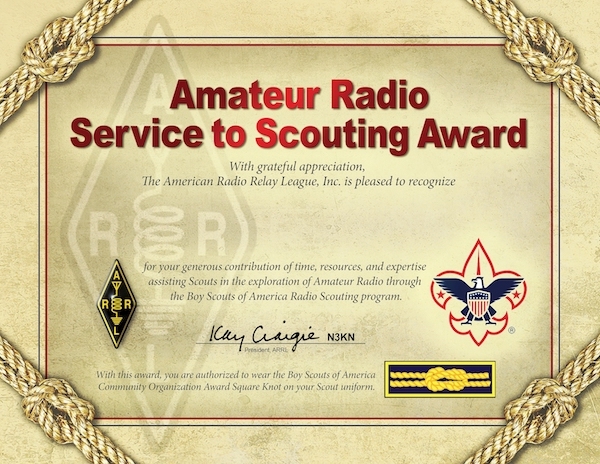 Nominations for the Amateur Radio Service to Scouting Award are made through the appropriate ARRL Section Manager. A nominee must meet five of 10 requirements. The requirements range from teaching the Radio Merit Badge to participating in the Jamboree On The Air (JOTA), to providing communications support for Scouting events. Scout leaders cannot nominate themselves. You can find the nomination form and the list of those who have received the award at the ARRL's Amateur Radio and Scouting page. Once the ARRL Section Manager approves the award nomination, they submit the completed nomination form to the Supervisor of the ARRL Field Organization Team. They, in turn will issue the certificate show above and return it to the Section Manager for award to the recipient. Note that the ARRL Section Manager is the only required ARRL approval for this award. For those completing the nomination form, note that at the end of the form is the line “Certification of Scouting Registration and member in good standing.” There is a line for “title” and a line for “date.” A signature would also be required. This certification can be completed by the Boy Scout troop, Cub Scout pack, or Venturing crew leadership. This can also be done by a BSA District Leader, Council Registrar, or similar position within the BSA that has direct knowledge that the nominee is a registered member. Obtaining this certification should be accomplished by the person filing the nomination. How to get the square knot: It's simple. Once a volunteer has been recognized with one of the approved awards above, just take documentation of having received that award such as a certificate, letter, medal, etc. to a Scout Shop to purchase the Square Knot, No. 613864.